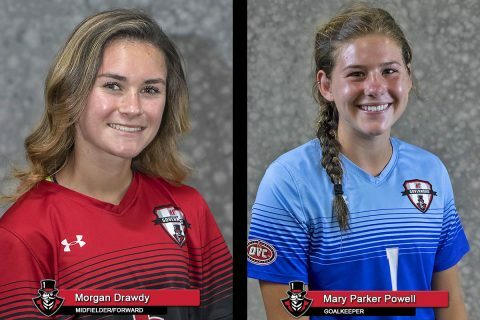 Drawdy won her first career OVC Offensive Player of the Week award, as she scored a brace against Chattanooga to lift the Govs to a 2-1 comeback victory. The sophomore midfielder scored the equalizer off a close-range volley from a deep cross and then converted her second penalty kick of the season for the winner after a handball in the box. Drawdy is now only one of four players in program history to score multiple penalty kicks in a season. A second-team All-OVC honoree as a freshman, Drawdy has started all seven matches this season for the Govs and leads the team in minutes played among midfielders. Powell earns her third career OVC Goalkeeper of the Week honor and her second this season. Powell made a season-high seven saves in the 1-0 win against Mercer and picked up her fifth win in goal against Chattanooga, collecting four saves in the 2-1 win. Powell has kept three clean sheets this season and also contributed to a fourth shutout this season. Catch Drawdy, Powell, and the Govs back in action this weekend with two home OVC matches to kick off conference play. The Govs take on Belmont, 6 p.m., Friday, before facing off against Tennessee Tech, noon, Sunday.